On Monday, November 25, UNB Vice-President Academic (Fredericton), Dr. Tony Secco, announced a gift of $200,000 a year for the next three years to support student Travel Study Awards. The award allows more full-time undergraduate students to participate in the UNB Travel Study Programs and builds on the success of a flagship program of the faculty of arts. “For nearly twenty-five years now I have watched the faces of students as they make their first climb up the Acropolis in Athens, or hiked the Venetian fortifications atop the Acrocorinth, or placed their feet on the starting line in the Stadium at Olympia,” says Dr. James Murray, professor in UNB’s department of classics. 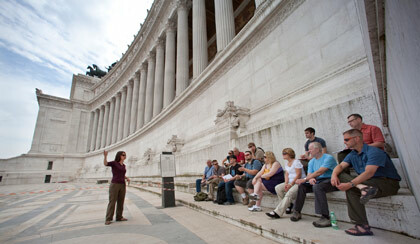 In 2014, students can travel to Berlin, France, Rome, and Second World War sites in Italy. The Travel Study Award is open to full time undergraduate students who are in good academic standing. UNB's travel study program is both longstanding and unique with a wide range of short three- to six-week programs. Since the first programs were offered in the early 1980s in Greece and the 1990s in Rome, the travel study program has grown significantly. Travel study options are currently offered for Berlin, China, France, Greece, Italy, London, and New York.